Post-school progression routes: All girls completed their schooling successfully, with good or excellent grades in the tawjihi exams and most progressed to higher education. Left to Right: Lana, studying Dentistry at Al Quds University; Tala, Nursing at Al Maqased Hospital; Rawan, Computer Engineering at Birzeit University. Left to Right: Taymah, Medicine at An Najah University in Nablus. Wala has been studying Hebrew with a view to applying to the Hebrew University. She has now obtained a place to study Biomedical Sciences. Haneen, Primary Educaation at Bethlehem University assisted by a DSMT HE partial scholarship. Narmeen, Law, Birzeit University assisted by a DSMT HE scholarship. Left to Right: Ruaa, Accountancy at Bethlehem University. Tala, Biotechnology at Al Najah University, Nablus. Maram Physics and Education also at Al Najah, assisted by a DSMT HE partial scholarship. Left to right: Bara’a, Medicine at Al Quds University. Hanan took a gap year after school to learn Hebrew and is now studying Architecture at Ort College in Jerusalem. Aseel, also Medicine at Al Quds. Left to right: Batool, Audiology and Speech Therapy at Birzeit University. Rinad, Arabic Language at Birzeit. Ruba, Civil Engineering at Birzeit. Left to right: Tamara completed her schooling and married soon afterwards. She is studying part time at Al Quds Open University on a Health Management degree and had her first child, a little boy, in September 2018. Reem, Graduated in Pharmacy from Al Quds University. Nour Graduated in Sports Science from An Najah University. After volunteering as a gym instructor in schools to gain experience, she worked as a teacher in a primary school. She had a baby girl in summer 2018. DSMT is grateful to Abraaj Capital, Dubai, for their generous contributions to the school scholarship fund between 2007 and 2010. Left to right: Raneen, graduated in Business from Wagdi Abu Gharbiyeh’s College, Jerusalem. Now married with children. Shaima, graduated in Administration and Political Science at Birzeit University in 2015. After several internships including with the UN Development Programme, her determination paid off and she now has a paid position with the charity Mercy Corps. 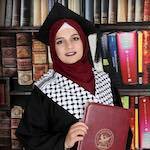 Shatha, graduated in Medical Laboratory Studies at An Najah University, Nablus. She worked for some time as a volunteer at Hadrassa Hospital and now has a job as a Medical Laboratory Technologist. Left to right: Shatha, graduated in Medicine from Cairo University and Al Makassed Hospital in 2016. Narmeen, Business Administration at Al Quds University, now married with children. Wisam, now nursing in the USA. Left to right: Samah, qualified as a doctor in 2015 from the Science and Technology University, Jordan. Rwaida, graduated in English from Birzeit Univerity. Dua’a completed teacher training, now married with children.